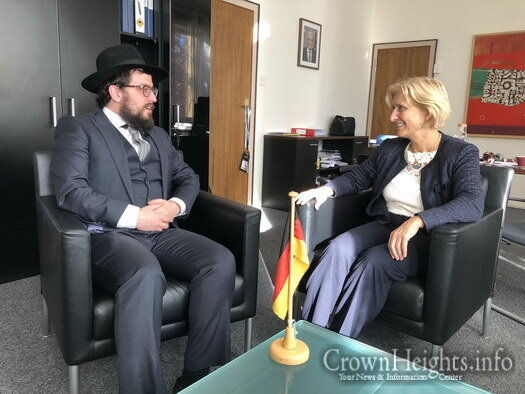 Chairman of Chabad in Australia’s Capital, Canberra, Rabbi Shmueli Feldman, had an important meeting with the Ambassador of Germany to Australia, Dr Anna Prinz. 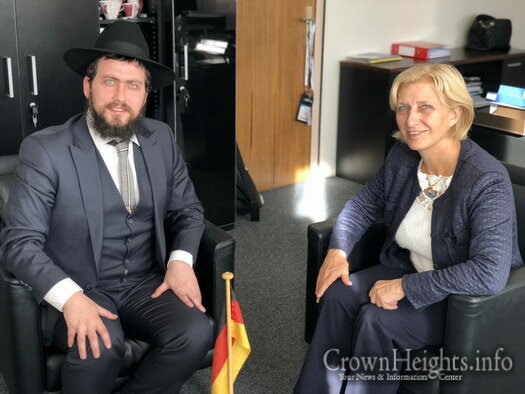 The meeting comes after Rabbi Feldman held discussions with Rabbi Yisroel Diskin, the Head Chabad Rabbi to Germany, about the alarming rise of anti-Semitic incidents. Germany has been in the spotlight lately due to a video of a man beaten for wearing a Kippah. Whilst the Kippa beating incident went viral, most incidents are not made public. Figures from the Berlin Research and Information Centre on Antisemitism showed a massive increase of 60% in anti-Semitic attacks from the previous year. 2017 saw 947 recorded incidents whilst 2016 recorded 590. Chabad in Germany operates in 19 cities with 31 Chabad Rabbi/Emissary families serving more than 10,000 Jews. Chabad is also Australia’s largest Jewish outreach movement, with over 100 Emissary families serving thousands of Jews in some 100 community organisations. 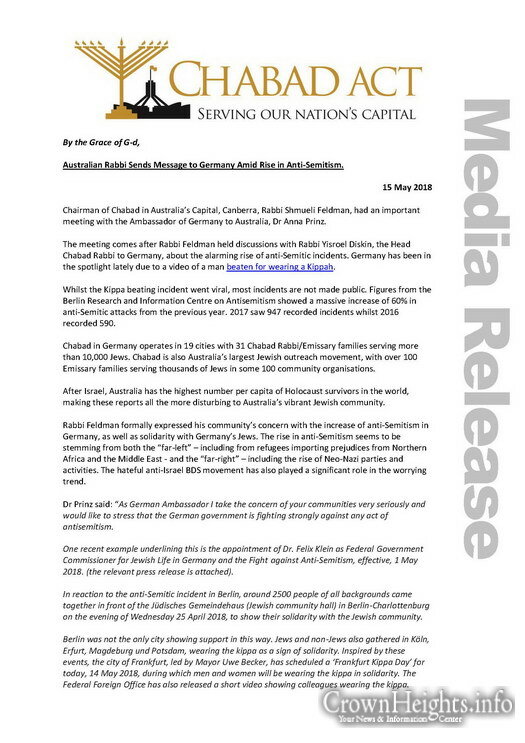 After Israel, Australia has the highest number per capita of Holocaust survivors in the world, making these reports all the more disturbing to Australia’s vibrant Jewish community. 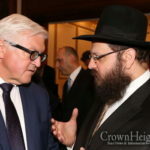 Rabbi Feldman formally expressed his community’s concern with the increase of anti-Semitism in Germany, as well as solidarity with Germany’s Jews. The rise in anti-Semitism seems to be stemming from both the “far-left” – including from refugees importing prejudices from Northern Africa and the Middle East – and the “far-right” – including the rise of Neo-Nazi parties and activities. The hateful anti-Israel BDS movement has also played a significant role in the worrying trend. Dr Prinz said: “As German Ambassador I take the concern of your communities very seriously and would like to stress that the German government is fighting strongly against any act of antisemitism. 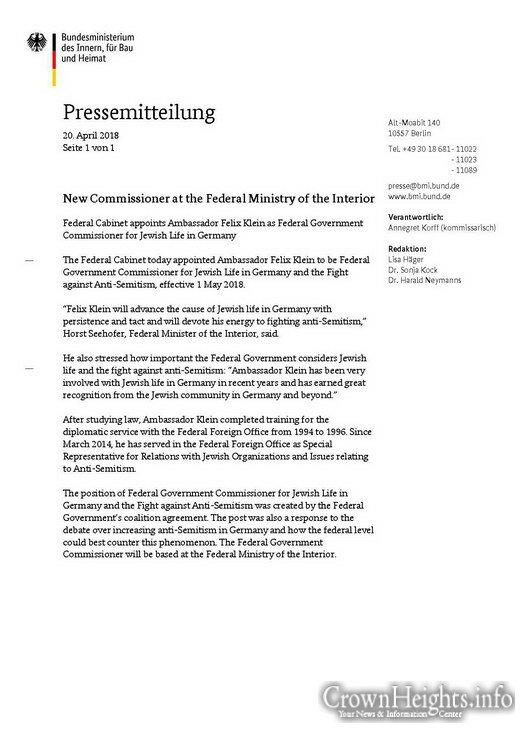 One recent example underlining this is the appointment of Dr. Felix Klein as Federal Government Commissioner for Jewish Life in Germany and the Fight against Anti-Semitism, effective, 1 May 2018. (the relevant press release is attached). In reaction to the anti-Semitic incident in Berlin, around 2500 people of all backgrounds came together in front of the Jüdisches Gemeindehaus (Jewish community hall) in Berlin-Charlottenburg on the evening of Wednesday 25 April 2018, to show their solidarity with the Jewish community. Berlin was not the only city showing support in this way. Jews and non-Jews also gathered in Köln, Erfurt, Magdeburg und Potsdam, wearing the kippa as a sign of solidarity. 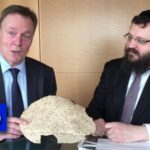 Inspired by these events, the city of Frankfurt, led by Mayor Uwe Becker, has scheduled a ‘Frankfurt Kippa Day’ for today, 14 May 2018, during which men and women will be wearing the kippa in solidarity. The Federal Foreign Office has also released a short video showing colleagues wearing the kippa. 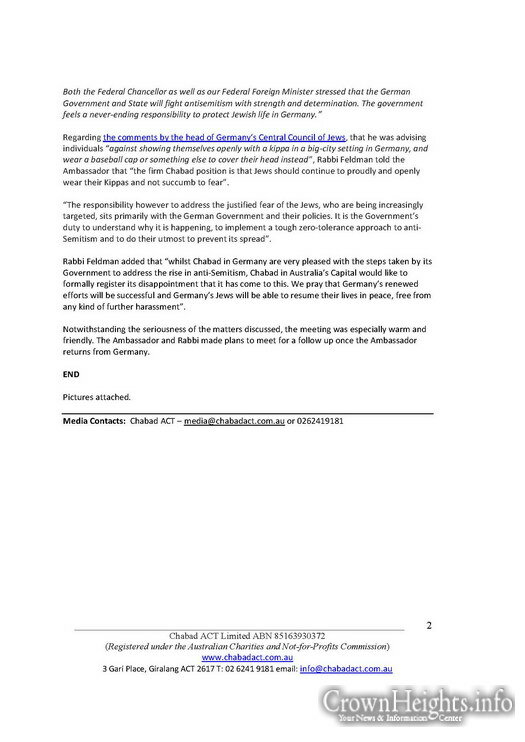 Regarding the comments by the head of Germany’s Central Council of Jews, that he was advising individuals “against showing themselves openly with a kippa in a big-city setting in Germany, and wear a baseball cap or something else to cover their head instead”, Rabbi Feldman told the Ambassador that “the firm Chabad position is that Jews should continue to proudly and openly wear their Kippas and not succumb to fear”. “The responsibility however to address the justified fear of the Jews, who are being increasingly targeted, sits primarily with the German Government and their policies. It is the Government’s duty to understand why it is happening, to implement a tough zero-tolerance approach to anti-Semitism and to do their utmost to prevent its spread”. 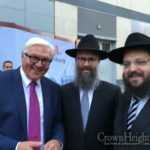 Rabbi Feldman added that “whilst Chabad in Germany are very pleased with the steps taken by its Government to address the rise in anti-Semitism, Chabad in Australia’s Capital would like to formally register its disappointment that it has come to this. We pray that Germany’s renewed efforts will be successful and Germany’s Jews will be able to resume their lives in peace, free from any kind of further harassment”. Notwithstanding the seriousness of the matters discussed, the meeting was especially warm and friendly. The Ambassador and Rabbi made plans to meet for a follow up once the Ambassador returns from Germany.